It’s tough to find a topic that spawns more cynicism, skepticism, and outright hatred on the Internet than investment banking networking. …or a giant waste of time in which students spend countless hours attending information sessions standing around crowded bankers, unable to set themselves apart. The truth is somewhere in between those two extremes. Networking is like lifting weights at the gym: If you use the “proper form,” you do it consistently over a long period, and you can tolerate the boredom and grind, it can be very effective. But if you do it incorrectly, you use the wrong strategy, you’re inconsistent, or you’re not in a position to benefit from it, you’ll never get results. Notice how the definition mentions “relationships” twice. Yes, you can cold email or cold call people and ask directly for internships or jobs, but that is not the ideal way to conduct a networking effort. Investment banking networking is not just about the end goal of winning an offer, but about getting to know bankers on a personal level. And if you’re not sure whether or not investment banking is for you, networking with dozens of bankers will reveal your preferences quickly! Why Is Networking Important In Investment Banking? Imagine that it’s 3 AM and an Analyst is looking through a stack of 200 resumes. Each student’s resume starts to look the same after a few minutes – a corporate finance internship, a Big 4 internship, a 3.7 GPA, a target school… yawn. The Analyst starts falling asleep because these resumes are boring, and he doesn’t know anyone personally. But after dozing off and waking up again, the Analyst sees your resume and immediately recognizes your name because he spoke with you on the phone a few months ago. He doesn’t even look at your work experience or grades, but he remembers your conversation. Based on that, he immediately puts you into the “Interview” pile. In a sea of identical-looking students and professionals, networking is the only way to set yourself apart. Also, since recruiting is now hyper-accelerated and requires a sequence of previous work experience, you need to network to win other internships before you even apply to junior-year summer internships at large banks. You don’t know that a specific person will select interview candidates, but networking is about tipping the odds in your favor. If you speak with dozens of bankers, your chances of winning interviews will increase significantly. There are no certainties in life; only probabilities. Bankers know that you want an internship or job, but that’s how the game is played. They’ll respond because if they recommend you, and you perform well, it will make them look good. And if you stay in the industry, you could become a valuable contact for them in the future. Networking “works” everywhere, but the rules are different in some regions, such as mainland China. 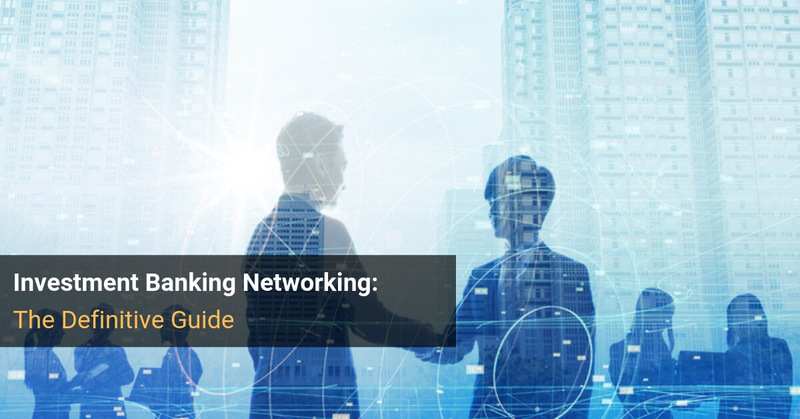 Despite rumors to the contrary, networking works well in the U.K. and other financial centers outside the U.S., as our many case studies with U.K.-based readers demonstrate. Use LinkedIn to find professionals in your target industry, and then contact them via email. Or, locate nearby events hosted by banks or organizations like the CFA Society and find a way to attend. So… you have enough time for marginal tasks, but not enough time for high-ROI tasks that will boost your odds of winning job offers that immediately put you in the top ~5% of income earners upon graduation? If no one responds to you, then you are using the wrong channel (e.g., LinkedIn messages rather than email), your initial outreach message is bad, or your profile is not good enough to get into IB. You can fix or get around most of these. Do you have a chance of getting into investment banking (or whatever field you’re aiming for)? If so, how much time is left before internship/full-time recruiting begins? What types of recruiting channels do you have access to? To answer question #1, you should take a look at our article on how to get into investment banking – especially the part about the main pathways into the industry. If you have no realistic chance of getting into IB, then you should stop here and consider other options, such as Master’s or MBA programs or working in a different industry first. The second question about time is important because building relationships with bankers takes months of effort. So, if you are about to graduate and you need to find a job ASAP, “building relationships” won’t work; you’ll have to rely more on cold calling and cold emailing. The third question about recruiting channels is important because you have a huge advantage if you attend a “target school” with many alumni in the industry. If you don’t have that same kind of access to alumni in investment banking, the entire process will take more time and effort, and you’ll have to rely more on cold calls and cold emails. You are an undergrad, and you have at least 6 months before internship recruiting begins (and ideally more like 12 months). Or, you are already working full-time in a related field, and you’re seeking a lateral role at a bank (whether you’re a recent grad or an older candidate). Or, you are an incoming MBA student, and you’re aiming for an IB summer internship that you convert into a full-time role. If you do not have 6-12 months to conduct this effort, or you don’t fit into one of these categories, you’ll have to use other methods (see below). First, find names of bankers on LinkedIn and via your school’s alumni network, if applicable. You will get higher response rates from junior-to-mid-level bankers (Analyst through VP), so focus on them first, and then get referrals to reach senior bankers. Then, determine the appropriate email format for each person, check that the email address exists via Email Checker, and add the person’s name, email address, and key facts (school, major, firm, previous experience, interests, etc.) to your list. Email the person to request an informational interview, and follow up 2-3 times if you do not hear back at first. This email should be 5 sentences at most, and it should reference very specific details you have in common with the other person. If you do hear back, set up the call and do 15-20 minutes of additional research on the person right before the call. Conduct the informational interview on the phone. Spend your time listening and asking questions about the person’s career and tips that he/she has for your job search. At the end, make a “mini-ask,” such as passing your resume along to others in the group or for referrals to other bankers. Drop a hint about a possible future in-person meeting or weekend trip to their city. Then, if it is logistically possible, conduct a weekend trip several months later and meet up with the person just before recruiting begins. If you can’t do this, send 1-2 email updates or speak again on the phone and ask more specific questions this time. Then, make your “real ask” and ask if the person can pass along your resume or otherwise plug you into the recruiting process at their firm. You can get started with your email outreach once you have gathered 20-30 names. If you’re at a target school and have solid alumni access, you can expect to send a few hundred outreach emails; if you’re at a non-target school or you do not have the same access, you might send more like 1,000 – 2,000 emails. Even if you send 10-20 emails per day, it will take months to complete this process. You’ll likely get a 10-25% response rate if you’re using a good template and contacting the right people. Out of the bankers who respond, you might speak with ~50% on the phone. So, you might end up speaking with between 50 and 200 bankers on the phone; a reasonable goal might be 2-3 calls per week. You can expect that 20-30 contacts will become useful and take real steps to promote your candidacy. Ideally, each one will be at a different bank so you’re not dependent on a few groups or firms. This reader was at a non-target school, but the same process applies even if you’re at a top university, you’re about to start an MBA, or you’re working full-time. If you’re working full-time, the main difference is that there’s no “recruiting start date” since banks make lateral hires as they are needed. So, your timing will depend on when you have enough experience to speak to in interviews, which might take 6-12 months to gain. One final note: I did not mention information sessions in the description above. That was intentional because for many students, these sessions are not that helpful. You can certainly attend them, but the key is to follow up immediately after the session and ask for 1-on-1 informational interviews with bankers, following the steps above. Networking at information sessions is nearly impossible because there are too many people crowding around the bankers there, and it’s difficult to associate names with conversations. And if you want even more on this topic, there are dozens of additional request and follow-up templates included in the IB Networking Toolkit we offer. You are an undergrad, and you are seeking an initial finance internship in your first or second year of school, especially at smaller firms. You are an incoming MBA student, and you want to complete a pre-MBA internship to give yourself a leg up. You are about to graduate from university, you missed recruiting, and you need to find something ASAP. And, ideally, you will be at a target school or have other brand names on your resume/CV, as they will make cold emails far more effective. Cold emailing to ask directly for internships or jobs will not work well if you’re already working full-time or you’re aiming for summer internships in the formalized recruiting process. In those cases, you should be using investment banking networking strategy #1 (informational interviews). A long time ago, I used to dismiss cold emailing as “spam” – who would respond to a random email sent by an undergrad with no real work experience?!! But as I conducted more interviews with M&I readers, I began to change my mind. Cold emails offer one simple advantage over cold calls: bankers live in their email inboxes. If you email them, they will see it, even if they do not necessarily respond. The steps in the cold-emailing process are very similar to the ones for informational interviews: you still find bankers, guess their email addresses, email them to request calls, and then do the calls. When you send the initial email, you ask directly about internships or jobs the group might be offering. On the call, you stay focused on possible openings in the group or other groups at the bank. There is no need to make a mini-ask; get to the point. If you get a “no” answer initially, which is very likely, it’s always worth following up a few months later to see if anything has changed. But you don’t need to schedule a weekend trip or do another call – just send a quick follow-up email. This reader graduated from a top university in the U.K. without real work experience and then cold emailed his way into a consulting internship, then a PE internship, and then an off-cycle IB job at a bulge-bracket bank in London. You should contact Group Heads or other senior bankers (MDs, Senior MDs, etc.) because they have a better sense of hiring needs across the firm and more power. And you will need at least one relevant internship or other work experience. If you have nothing, start with smaller firms, gain experience there, and then aim for off-cycle roles at the large banks. For more examples, see our article on investment banking email templates. And now we arrive at the last main networking strategy, and also my least favorite one. You should avoid cold calling banks and finance firms unless you have absolutely no other options. It tends to be effective only for undergrads and recent grads who lack work experience and have no other way to market themselves. If you attend even an average school and you have even mediocre internships, you’ll almost certainly get a higher response rate from cold emails. It rarely works at mid-sized-to-large firms, so this strategy limits you to boutiques. It’s a repetitive, ego-bruising process that entails more rejection than any other strategy. And finally, most students are terrible at speaking in real-time on the phone, especially in the age of texting/smartphones/social media. So, if you went to a completely unknown school, graduated with no work experience, have no marketable skills, and you want to focus on boutique banks, sure, knock yourself out with cold calling. Find a list of banks in your area, and then search for bankers’ names and contact information. You can use LinkedIn, Google, Google Maps, or, ideally, services like Capital IQ to do this. Plan your pitch and figure out what you’re going to tell them. Keep this very, very short (1-2 sentences) and state your university, major, and experience, and ask how to position yourself for an internship at this firm. Place the call and be prepared to respond to their objections (we’re not hiring, we don’t take interns, we don’t have money, etc.). You will also have to be nice to assistants to reach senior bankers or otherwise ask for the person in charge of recruiting. The numbers here vary widely, but you’re unlikely to get results until you’ve called a few dozen firms, perhaps 100+ firms, and tried to get through multiple times. He used some ninja strategies to get results with cold calls, including intentional phone disconnects, email format requests via assistants, and more. There is nothing that you – an undergrad, MBA, or career changer – can say that will “impress” a banker, especially a senior one. OK, maybe if you’ve won the Nobel Prize or started a $100 billion company… but then, why would you be recruiting for investment banking jobs? So, do not brag about your GPA, your parents’ wealth, your internships, your math skills, etc. You will get much better results if you show some vulnerability and ask for help with overcoming your weaknesses. LinkedIn is great for finding people and firms, but it is not ideal for contacting them; use email because everyone checks their email 24/7. Cold calling works at boutiques, but please do not cold call a Group MD at Goldman Sachs. If your initial outreach email is more than 5 sentences, it is too long. See the examples and templates above. At the same time, though, you need to include some specific details about the person so you get a response: a class or internship you had in common, a similar interest, being from the same city or region, etc. Networking, and perhaps life itself, is all about following up. Some bankers never respond to emails, but they track how many times students contact them – and they’ll give interviews to the most persistent ones. People get busy, life comes up, and messages get lost in the shuffle. So, if you don’t hear back the first time, try again… and again… and again. How much money bankers earn. How many hours they work. Basic industry information that you can find on this site. How they got started in the industry. How they moved from Job X to Job Y. How their university or MBA led them here. Aim to speak for 30% of the time and let the other person talk for 70% of the time. Many bankers “say” they’ll pass along your resume, but few get around to doing it. You must be proactive and make direct requests if you want to get results. If a banker said they’d pass along your resume last week, follow up this week to see if they did… and if not, politely ask again. If you want to work at their bank, ask directly how you can position yourself for an internship there. First, figure out if networking will be effective for you at all. If you do not have a realistic shot of winning investment banking roles, or you need a steppingstone role or other degree first, then you should focus on those for now. If networking will be effective for you, determine the time until recruiting begins and pick the right strategy. In some cases, however, cold emails will also be effective, and in some unfortunate cases, you may have to do some cold calling. Investment banking networking may not be fun, but it still beats digging ditches – or being a consultant. Been actively networking for a lateral role for a few months now. Talked to a ton of bankers per your great advice. Let’s say I see a postion pops up in a bank whom I know nobody there. What’s the best move? I’m thinking apply, and cold reach out to a banker in that group on linkedin who has anything in common with you and tell them that you applied and you want to learn more about the group to chat. Wanted to know ur thoughts on my method. Thanks! I would probably reach out to the banker first before you apply for the job because you ideally want someone you know at the firm to pass along your resume/application with a recommendation. But yes, reach out, say you found the opening and saw that the person had something in common with you, and you wanted to reach out and learn more about it. I wanted to ask you about “staying in touch”. I have been able to network and find people in great companies and positions who genuinely helped me out by meeting with me, referring me, passing a long my resume, etc. This network could be valuable in the future to keep advancing in my career. What are the best or some of the ways to stay in touch with these contacts? Do you think that sending an email annually is enough? Thank you in advance and I apologize if you have talked about this subject in another article. You don’t need to reach out that often. Just occasional reminders sent once or twice a year will work well. I would recommend setting aside 1 day every 6 months or every 12 months where you send a quick update email with 3-4 sentences to your contacts and maybe customize it a bit depending on who the person is and what you discussed with them before. You may not even need a full day to do it. Most readers who have a lot of success with networking wind up with around 20-30 good, helpful contacts at different firms, and you could probably send 20-30 emails in a few hours, assuming you already have each person’s information. I was wondering if you had a list of interesting questions that I could ask to a Senior Investment Banker? There is no set list of questions because they should be specific to the person you’re speaking with. Contrary to what many students think, you can’t just script out a conversation before the conversation actually begins. -I saw you worked in Industry X before investment banking. How did you transition in? -I saw you went to business school at Program X. I’m thinking about that in the future – what was your experience there like? -I have Background X and Y and have been encountering Problem Z when recruiting for IB roles. How do you think I should handle it? Hey Brian. I’m a final year economics student at a semi-target school in U.K. I have 2 internships at BB(Back office) and Commercial banking. I’m doing a summer internship 2019 in Big 4 corporate finance division, before starting MSc Finance at top target school in London in September, with the hope of getting into IB. My question is when should I start networking and reaching out to people with regards to getting an IB internship in summer 2020? Usually about 6 months before recruiting starts, which means right about now, assuming that applications in the U.K. for 2020 summer internships open up in August/September 2019 as they usually do. The key point is that in the U.K., you must apply for roles immediately once the application opens up because it’s first come, first serve. Additional networking at that point makes almost no difference compared with applying ASAP. I have two summer offers in NYC: Barclays S&T vs PWP IBD. The Barclays’ offer involves two rotations in two different desks. The matching process for the desks is quite mysterious, you get to express preferences and so do the desks based on your CV and then HR does the matching. My long term goal is to become a PM at a hedge fund and so I would like to join a HF as an analyst after 2-6 years at a major bank. Assuming I succeed in getting a full time offer, which one of these two offers me the best shot at exiting into a hedge fund. I am ineterested in all sorts of HF strategies (excluding quants) so do not base your answer on that, just base your answer on the probability of leaving for a hedge fund within 2-6 years. Oh yeah one more thing, assuming that I do not succeed in exiting for a hedge fund, how do you think the comp at Barclays S&T compares with that of PWP IBD? Thank you very much in advance!!! It really depends on what you want to do at the hedge fund: executing trading or investment analysis? If you want to execute trades, take the S&T offer; if you want to do fundamental, event-driven, or other analysis, take the IB offer. The only issue I can see is that I’m not sure offhand how well PWP places into hedge funds. I think elite boutiques and other banks in that range tend to be better for PE exits, but it depends on the industry/strategy match as well. I think you will probably earn more in PWP IBD long-term, especially since they won’t make a huge portion of your bonus stock or deferred, as Barclays and the other large banks will.